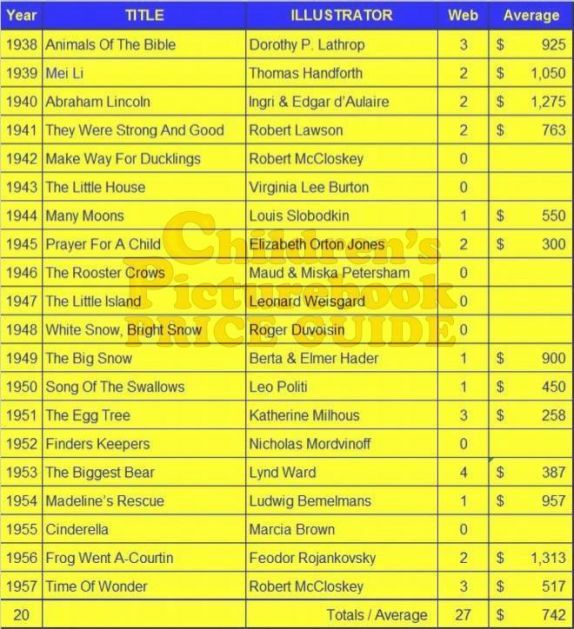 We recently performed an internet search for the first twenty Caldecott Medal books, wondering how many first editions are currently being offered for sale. The searches were performed across multiple book sites, ABE, ABAA, and Bookfinder, and were filtered for first edition books with dust jackets. Across the twenty Medal winning books, there are twenty-seven first edition books currently for sale, with an average asking price of $742. In our survey we did not adjust the asking price to the condition of the book being offered, so the average price should be used judiciously. Surprisingly, four copies of The Biggest Bear are on the market, the highest quantity for sale across the respective sample set. This book is normally a tough find in first edition format. In 1953, at the time of the award, Lynd Ward was a highly respective graphic artist, well known for his accomplished wood cuts in stylized artistic books. Barry Moser is the nearest analogy to Ward in the pool of contemporary illustrators.). Ward had been a successful graphic artist and book illustrator for twenty years, before he decided to author and illustrate The Biggest Bear, his first children’s book. The 1960 Weekly Reader Children’s Book Club Edition quite commonly surfaces for sale on the internet. Seven of the twenty books are not currently being offered for sale on the internet. As expected, Virginia Lee Burton’s The Little House and Robert McCloskey’s Make Way For Ducklings are not currently available. First editions, for either book do not surface for sale very often. Since 2000, we have seen only one first edition copy of The Little House for sale (Sigh…regrets abound). I cannot remember a copy of Make Way For Ducklings for sale; a copy sans DJ is currently being offered for $1500. It is a bit surprising that The Rooster Crows, White Snow, Bright Snow, and Cinderella are not currently on the market. Each of these books are not scarce in first edition format. The Rooster Crows is a Maud & Miska Petersham book, the 1946 Caldecott being a recognition for nearly 25 years of accomplished work in the picturebook market (the 1924 Poppy Seed Cakes, in first edition format, is one of many classic collectible books by the Petershams). Roger Duvoisin and Marcia Brown were at the pinnacle of their respective careers at the time of their first Caldecott Medal awards. Marcia Brown has won nine Caldecott awards, including three Medal books, and now tied with David Weisner for the most Medal awards (Weisner winning his third last week for Flotsam). The Little Island, illustrated by Leonard Weisgard, is a bit tougher to find, in part due to authorship by Margaret Wise Brown, under the pseudonym ‘Golden Macdonald’. Books authored by Brown have a collectible following, with The Little Island being the eighth book she wrote under the Macdonald pseudonym. Brown wrote her ninth, and last book as ‘Golden Macdonald’ some ten years later, in 1956, Whistle For The Train. Finders Keepers, illustrated by Nicholas Mordvinoff, is the seventh of the Caldecott Medal books not currently for sale in the market. This book does not surface too often in first edition format, in part because it has never had a large following. One of several peculiar books awarded the Caldecott Medal by the ALA, the illustrations seem as contemporary today as they seemed at the time of publication. We intend to repeat this survey on a regular basis, and would enjoy hearing your support, or not, to that end. Regularity? Likely 3 or 4 times per year feels about right to us. Your thoughts would be welcome.